Royal Field Artillery 5th Bde. Died 10-August-1916 aged 36 Killed in Action. Son of John Raynor Arthur of Hartley Wintney, late of the Bombay Civil Service and Aileen Spring-Rice of Normandy Park, Guildford, Surrey, England. John Raynor Arthur was born on 20 November 1830 and died on 19 November 1903 at age 72. He was previously in the Bombay Civil Service. Aileen Spring-Rice was the daughter of the Hon. Stephen Edmund Spring-Rice and his wife Ellen Mary Frere. Henry Bartle Compton Arthur was born on 14 October 1879 and his birth was registered in Kensington. He had an older brother, Edmond J Arthur born in India c1873. In the 1881 census, the family (no mother in evidence) was at High St, Hartley Wintney, Hants, probably back from India c 1875. In 1891 they were at 11 Queen's Gate, Kensington, this time the mother is there but no father, and 7 servants. In 1901 the family were at Normandy Park, Ash, Surrey, but neither Edmund nor Harryy is recorded, presumably because they were away in India. 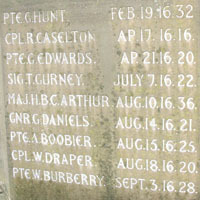 Indian Army records show that HBC Arthur was commissioned on the 28th July 1900. 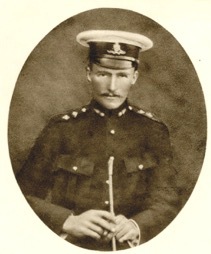 Harry attained the rank of Captain on the 21st August 1911. At that time he was with the Royal Horse & Royal Field Artillery in India. they moved to Mesopotamia in November 1915. In 1915 he was given the command of 64th Battery, which he held till his death, rendering distinguished service; he was twice slightly wounded and three times mentioned in Despatches. The Second Battle of Ypres, which took place some 25 miles north of the Indian Corps line, involved only the Lahore Division and the Lahore Divisional Artillery. On April 22, 1915, the Germans attacked the French and British in the Salient, an event infamous for the first widespread use of poisonous gas. On the night of April 24, the Lahore Division, which was about to relieve the Meerut Division just east of Neuve Chapelle, was ordered north to Ypres. The Lahore Division infantry took up a position on a line between St. Jean and Wieltze and counter attacked the Germans on the afternoon of the 26th. The Divisional Artillery, meanwhile, had set up near Brielen, a village just west of Ypres, and was supporting the Lahore Division infantry from that position. Harry almost missed this action. He had been in England on leave, and on arriving back at his railhead (probably Béthune) on the 25th, discovered that the Lahore Divisional Artillery had left for Ypres. He found what he referred to as a “Samaritan car” and rejoined his 5th Brigade in time for the action on the 26th. The Lahore Division infantry was pulled out between April 29 and May 1, but the Divisional Artillery stayed in position until May 3, assisting the French who were holding the line west of the canal. Harry was back in the Indian Corps sector in time for the Battle of Aubers Ridge on May 9.
later to the 3rd Canadian Division. (See War diaries at http://www.canadiangreatwarproject.com/warDiaryLac/wdLacP31.asp . It is clear that between December 1915 and the end of June 1916, Harry was in the southern part of the Ypres Salient. 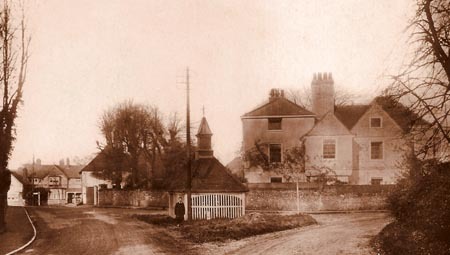 The photograph on the right taken around the time of the first World War shows Well House on the right hand side, named after the village well shown in the foreground. In the distance, on the left handside, a signpost is clearly visble. This stood on a small triangle of ground in the middle of the road. It was to become the site of the War Memorial erected in 1921 and Harry's name would be on it, just a few yards from his family's home. Harry's letters from the front were addressed to his unmarried sister, Leonora Arthur, of Well House, Banstead, and the section on Banstead in A History of the County of Surrey , published in 1911, mentions that Well House "... is now the residence of the Hon. Mrs. Arthur." That was Harry's mother, who died in 1916. 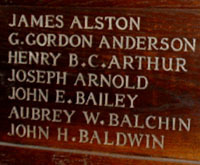 The Arthur family connection with Banstead is through the oldest daughter, Aileen Mary, who was married to Sir Henry Lambert. Christina Lucy Arthur (1875-1962), the youngest daughter, was married to Robert Vaughan Johnson, and they lived in Banstead with their four daughters. Harry gained the rank of Major whilst still in the service of the Royal Field Artillery. In July 1916 the Lahore Divisional Artillery moved south to the Somme. They spent a couple of weeks at rest in Fieffres (about 15 miles northwest of Amiens) and then moved east over several days to Albert. At this time, the British army in France was dangerously lacking experience. The original British regular army, six divisions strong at the start of the war, had been effectively wiped out by the battles of 1914 and 1915. The bulk of the army was now made up of volunteers of the Territorial Force and Lord Kitchener's New Army, which had begun forming in August 1914. Major Arthur was a very experienced soldier and therfeore a great asset to the army at that time. The battle of the Somme started on the 1 July 1916 with horrendous nnumbers of casualties on the British side. No significant progress was made in the northern sector in the first few weeks of July. Ovillers, was not captured until 16 July. Its capture, and the foothold the British had obtained in the German second position on 14 July, meant that the chance now existed for the German northern defences to be taken in the flank. The key to this was the village of Pozières. The Fourth Army made three attempts to seize the village between 14 July and 17 July before Haig relieved Rawlinson's army of responsibility for its northern flank. The capture of Pozières became a task for Gough's Reserve Army. Going in shortly after midnight on 23 July, the attack on Pozières was a success, largely thanks to very careful preparation and an overwhelming supporting bombardment; however, an attempt to capture the neighbouring German second position failed. The Germans, recognising the critical importance of the village to their defensive network, made three unsuccessful counter-attacks before beginning a prolonged and methodical bombardment of the village. The final German effort to reclaim Pozières came before dawn on 7 August following a particularly heavy bombardment. Divisional Artillery diary for the same day, there is a note of Harry’s death, along with that of two subalterns and an RAMC Captain attached to the 5th Brigade. The four casualties are buried in a row in Gordon Dump Cemetery, no more than a few hundred yards from where they were killed. Grave/Memorial Reference: I. A. 23. Burke's Peerage, Baronetage & Knightage, 107th edition, volume 1, page 150. Family history research by Barbara Rough. Additional family information from Susan Lucy granddaughter of Christina Lucy Arthur .